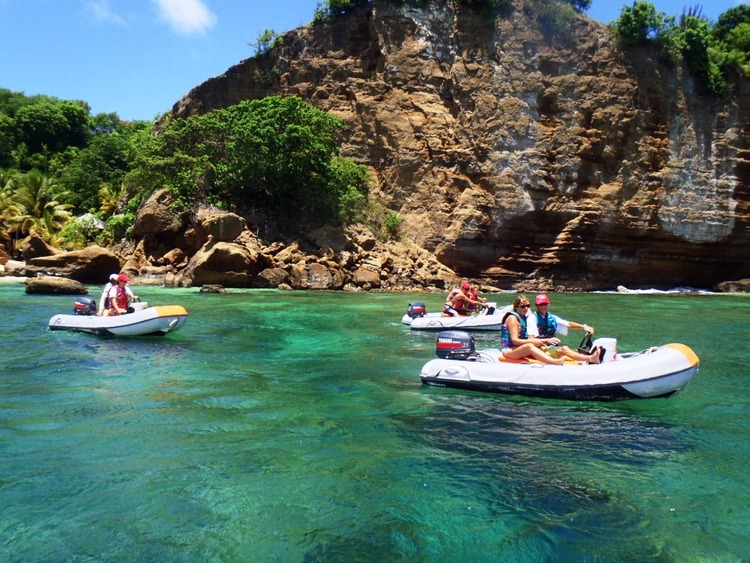 We discover the island of Grenada in an unusual and thrilling way aboard E-Sea Riders two-person inflatable motorboats. After a short transfer to the E-Sea Riders base in the lagoon of St. George, we are welcomed by the staff who explains us how to use these inflatable motorboats before venturing into Caribbean Grenada. We pass by the large yachts of Port Louis Marina and inside St. George’s Carenage before reaching the Caribbean Sea. After seeing its picturesque colourful coast, we stop at the Underwater Sculpture Park, where we can snorkel or go for a swim. The excursion is booked on a per jet ski basis and not per person. It is not possible to book and participate in this excursion individually. The E-Sea Riders Boat jet skis can hold two persons. In case of single occupancy, two tickets will be charged. All drivers must be in possession of a valid driving license and be over the age of 18. When on board the jet ski, it is mandatory to wear a life jacket. Maximum weight per inflatable jet ski: 180 kg. A guide will accompany us on the excursion and provide information in English. The excursion may take place in the morning or afternoon. The departure time will be provided in the Diario Bordo the evening beforehand.